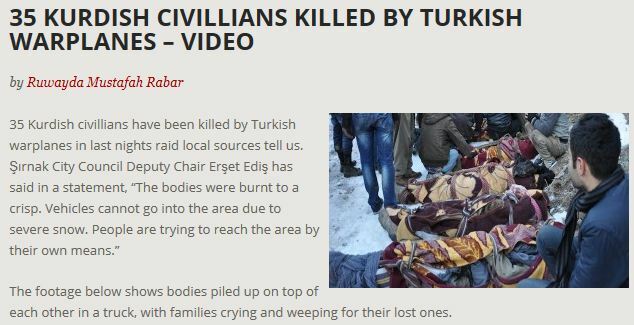 TURKISH WAR PLANES KILL 39 KURDISH CIVILIANS…….. – The Tundra Tabloids……. TURKISH WAR PLANES KILL 39 KURDISH CIVILIANS…….. I have no idea just exactly who these Kurds were, but by their names alone, it looks like they all came from pretty much the same family. This happened in December of last year, exactly a month ago and I’m just hearing about this now. You can see very well the hypocrisy of the media in situations like this, as well as in the UN. If this were a case of an Israeli plane and Arabs, the whole world would be howling, with all kinds of resolutions being passed in the UNGA condemning Israel. Next Post Next Post NICOLAI SENNELS: ISLAMONAUSEA, THE WORLD IS SICK AND TIRED OF IT……. Yes had this story in december, one thing not a single MSN paper asked was the following which i did ask. Was the raid approved after info received from a U.S. drone? U.S. drones are operational in Turkey! UN condemnation in 3..2..1… Oh wait: never going to happen!